The single sock is progressing. Need to pay attention and tiny needles means lots of work for little noticeable growth! 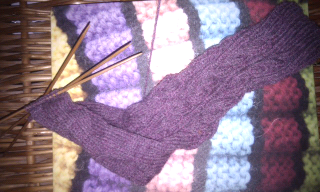 But I'm onto the toe decreases now so nearing end of first one. Feel as snuggly as imagined when I'm trying on for length. Reading a book about mindfullness. Can't recall the title but it encourages the reader to live in the moment i.e."being". A wise former colleague of mine encouraged me to consider a raisin. So THIS is what he was talking about. I am seeing a link between the flow you feel when doing something you enjoy (for me one of my mindful occupations is, what do you know, knitting). My past experiences of Tai Chi, Chi Gong and Yoga all taught me to focus on the now, observing thoughts. Might explore this subject further in my blog. No followers as yet so might as well pander to my own musings.